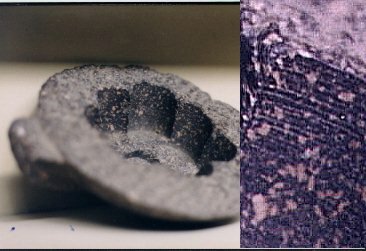 In 1996, this tube-drilled piece of granite was on display in the Cairo Museum without any associated identifying information. The photo (click to see full size) clearly shows spiral grooves on the visible portions. 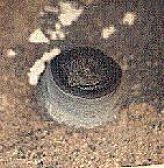 The grooves can be seen to be of regular depth and spacing, and occur in all of the holes in this piece. As the holes overlap, were these grooves caused by abrasive slurry, they would not be expected to be so consistent. 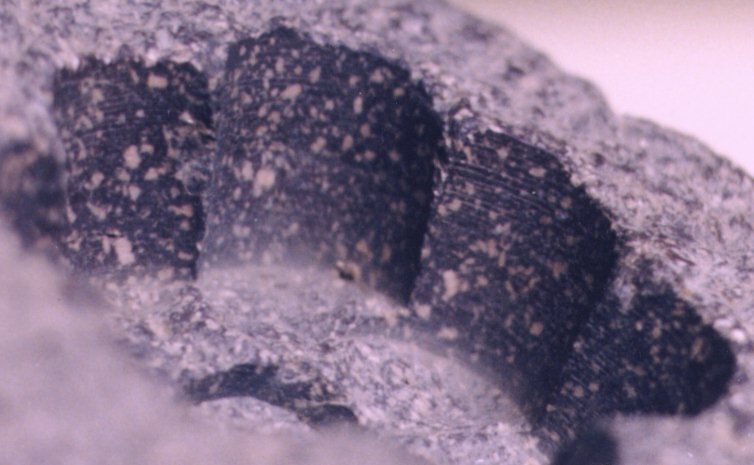 These grooves seem to support Petrie's conclusion of "jewelled points" set into bronze tube drills. 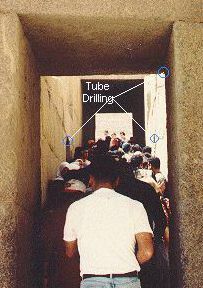 The ancient builders used a tube drill to hollow out the sarcophagus in the King's chamber of the Great Pyramid - they drilled off course and left a tube drill mark on the top inside of the box on the east side. They did some extra polishing to fix it up a bit but if you go to the King's chamber you can still see it if you look carefully. 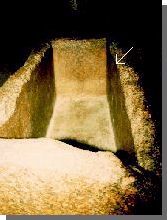 Looking at the radius of the cut in the sarcophagus (less than 2") it is obvious that in this one piece alone the masons made thousands of holes - each several inches deep. The craftsmen who did this had mastery of the principles of drilling round hollow holes in any material, soft or hard: wood, stone, or metal, and could have drilled virtually any naturally occuring material on this planet. 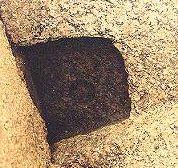 What you see in these two photographs are holes made by a tube drill in red granite. 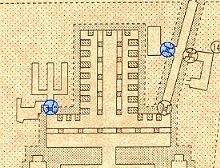 The blue circles on the floor plan are where they can be seen in the overhead door lintels of the granite lined Valley Temple near the Sphinx. Most of the doorways in this temple still show evidence of tube-drilling. It seems that the holes were used to hold in place long vertical rotating shafts on which the doors were hung, like hinges. The circles on this photo show some of the places where visitors to the temple can look. A primitive version of tube drilling can even be done with a bamboo drill bit, a bow saw and sand. However, making a bit tough enough to drill holes in granite is not simple, easy or primitive. Drilling with a tube is a specialized method that won't develop without the need for a large hole. These holes indicate a technology not developed for just this purpose, but for many earlier and easier purposes; generations of development over many projects, over hundreds of years. They imply mining and metallurgy, bit manufacturing, generations of experience with grinding materials, rotational manufacturing techniques - the wheel and all that goes with it. What was the motivation for this development and is there a corresponding archaeological record in Predynastic and Old Kingdom Egypt?